Pananaw ng Sining Bayan, Inc, in partnership with Japan Foundation Manila Office, the Lopez Memorial Museum, the Kalaw-Ledesma Foundation, the Yuchengco Museum, Vargas Museum and Pinto Museum will hold the conference Locus Redux: Speaking Across Contexts, Learnings and Negotiations in Writing and Teaching on Art. 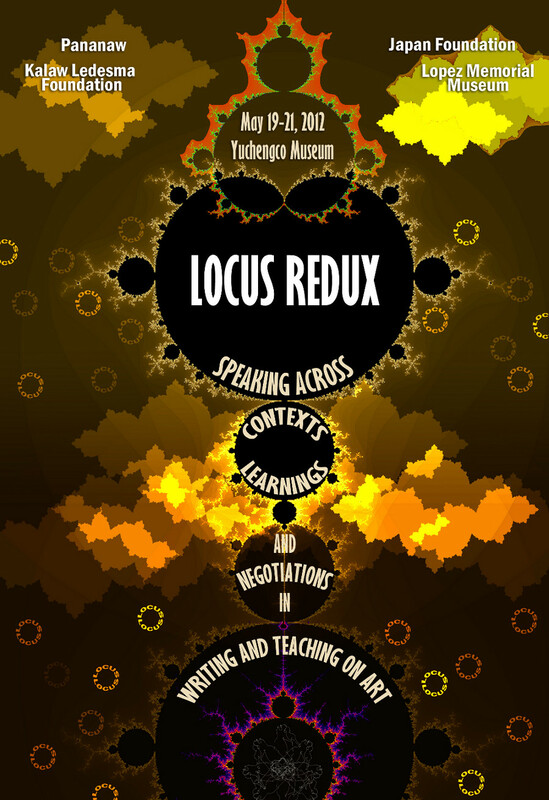 An international conference to be held at the Yuchengco Museum in Makati City on May 19-21, 2012, it will touch on themes such as new pedagogy, deschooling, mobile learning, migrating art academies, web 2.0, among other developments in the teaching about art and design. Padmapani and Feliz Perez (Baguio Writers Group/Café by the Ruins soup kitchens). The conference hopes to facilitate sober and grounded discussions that productively cut across disciplines which play into the making of culture. Session topics include Knowledge Production via Discourses on Art, Articulating Modernisms, Education Out of Bounds, Platforms and Histories and Extended Engagements. There will also be half-day tours to studios and museums to encourage continuing post-conference engagements. Conference fee is Php2,000.00 to cover the conference kit, meals (3 lunches, 3 morning and 2 afternoon snacks) and a certificate of participation/attendance. For more information, pls contact Ms Fanny San Pedro/Mary Ann Pernia of the Lopez Museum at +632 6312417 or via email through lmmpasig@gmail.com.